An older lover brings a cryptic letter to Paris, pulling Eddie Grant reluctantly into a treacherous web of intrigue and death — but giving him a slim chance to find the terrorists who murdered his family seven years before. It launches him on a dangerous quest through Paris and the Loire Valley for the most valuable piece of Nazi loot that remains missing, a famous Raphael self-portrait from the early 16th century, along with the crates of Nazi bullion that accompanied it — all intended to finance the Fourth Reich. Jen Wetzmuller, daughter of his father”s World War II colleague in Army Intelligence, arrives in Paris, bearing a letter she found after her father was run down by a car on the streets of Sarasota. Its clues take Eddie from his Paris home to Florida, where he works to solve the mystery, barely escaping with his life. Then it”s back home to burrow into the darkest reaches of the German occupation in search of the treasure. Along the way he and Jen restart the brief, fiercely passionate affair that he abandoned, to his regret, 20 years before Sarasota. 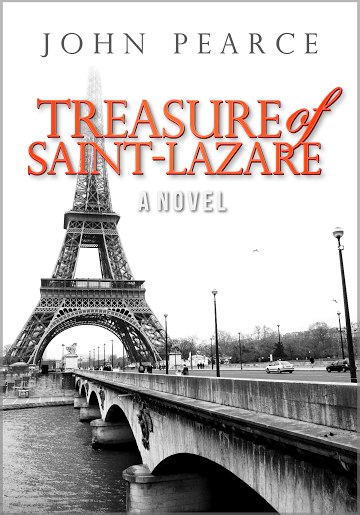 Most of all, Treasure of Saint-Lazare is a novel about Paris. John Pearce is a part-time Parisian, but lives quite happily most of the the year in Sarasota, Florida. He worked as a journalist in Washington and Europe, where he covered economics for the International Herald Tribune and edited a business magazine. After a business career in Sarasota, he spends his days working on his future books – a sequel he expects to publish later in 2014 and a prequel after that. For several months each year, he and his wife Jan live in Paris, walking its streets, and chase down interesting settings for future books and his blog, JohnPearceAuthor.com. They lived earlier in Frankfurt, Germany, which gave him valuable insights for several of the scenes in his sequel, whose working title is Last Stop: Paris.